Hero’s Special Ability electric scooter – could be a bike for ALL! | PlugInCaroo… Karo plugin… abhi!… save the environment!!! Hero’s Special Ability electric scooter – could be a bike for ALL! For a long time, physically challenged persons have had to get their two wheelers modified on their own to add two extra wheels. This has meant that the wheels are not covered under manufacturers warranty or vehicle insurance. Hero Electric has taken up the cause of solving this issue with its Optima Plus Special Ability electric scooter. their own independent suspension for added comfort. The mudguards have been equipped with lights and reflectors so that they don’t pose a problem for other drivers in daytime or at night. It also uses the same 20 AH battery as the Optima Plus and due to its additional road contact patch and weight, is able to deliver a maximum of 70 kms per charge. That is still a good range for an electric scooter so we feel that this is indeed a very well made scooter from Hero Electric. India’s leading electric two-wheeler manufacturer, Naveen Munjal-controlled Hero Eco, will be launching an electric motorcycle in 2017. The company has also developed a special ability vehicle which is waiting for certain government clarifications before it is finally launched in the country revealed Sohinder Gill in an exclusive interview with Motown India in New Delhi. “From the flagship product we have an electric bike which will come out in 2017. We have developed the product, seen its performance, we are tweaking it and it is ready to go to ARAI for its six months testing,” he said. He further stated that “One of the products that is waiting for clarification from the government for certification process is the special ability vehicle. This vehicle is so beautiful and easy to ride for a person who has some physical challenges. The government is still not clear how to certify it. As soon as it is certified, it will be on the road”. He noted that his company will not be entering the segment of cars or quadricycles for manufacture. With a subsidy in place, Gill informed that his company will in less than one year bring out a product with lithium ion battery. “For two wheelers there will always be a fair percentage of vehicles with lead acid batteries. This is because the cost to weight ratio and cost to savings ratio compares unfavourably even after subsidy for a lithium ion product for a two wheeler. Unless there is a high performance bike and a long range bike, lead acid batteries will continue. These batteries are also graduating on the technology front. We have adapted them to India conditions, Indian temperatures and Indian vibrations. The batteries have started performing much better that they used to four years back,” he noted. We at PlugInCaroo welcome Sohinder Gill’s plan to promote lead-acid battery and would also like to point out that Chetan’s Maini switching from Lead-Acid to Li-Ion did not translate into x2 or x 4 or x10 increase in sales. At the minimum the people could be given a choice… between LA & Li-Ion and after a year or two of sales and its volumes can decide what type of battery to continue with. We at PlugInCaroo strongly believe that a good quality Indian branded LA battery is sufficient to overcome any initial hesitance from the customer side. LA battery performance have been proved over the years in commercial operation via electric rickshaws. If these electric bikes & rickshaws come with Aluminum bodies it would increase the range too. Also since this vehicle is a 3-wheel vehicle it can carry more weight… so the option should be given to the customer of a bike with 2 or even 4 batteries which could push the range to 280kms (4x70km)!!! This would also elongate the life of the battery as it will be recharged only once a week which would be more convenient for the user too. Bike with Solar Roof can add 50kms range DAILY to your Ebike! – and no need to plug-in to recharge! Adding a solar roof would ensure that the bike is continuously charging during day time providing an extra 50kms range. Solar Roof will add 50km range DAILY even without pluging in to charge. In 4 days it could add 200km thus with 4 batteries (70km x 4 battery = 280km) and solar roof this bike could have a theoretical range of close to 500kms if used for normal “every-day-use”!!! So you will have to recharge it only once in 8 to 10 days which is similar to a petrol bike/car use but much cheaper. If daily usage is below 50kms then this bike will never need to be plugged in to the grid to charge. MEANING CLEAN AND SUSTAINABLE MOBILITY. 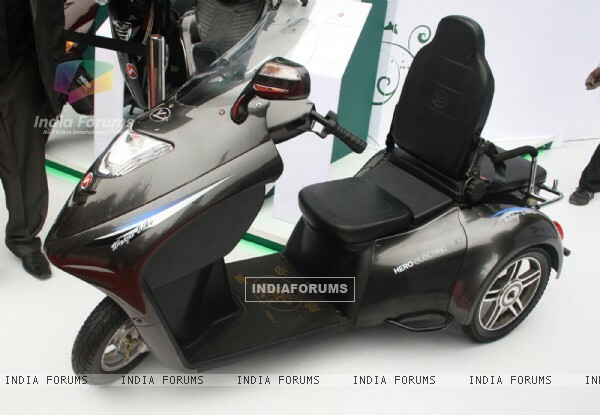 This entry was posted in Uncategorized and tagged 3 wheel scooter, 3-wheel, 3-wheeled, Hero, Hero Motocorp, hero optima plus, Hero' Special Ability electric scooter, Naveen Munjal, Optima, Optima Plus, scooter, Sohinder Gill, solar bike, Solar Panel, solar roof, solar roof bike, special ability, special ability scooter, three wheel scooter, three wheels on September 14, 2015 by PlugInCaroo. This special ability vehicle looks awesome. It definitely will be a boon as one doesn’t have to do separate modifications. It is always good to retain company design. Has this vehicle been launched? This vehicle is awesome. Is it released yet? Also are there any details online for the petrol version?